Sister Miriam Patrice Hausman, O.S.F. 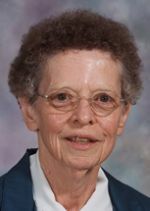 Sister Miriam Patrice Hausman, O.S.F., 77, died Feb. 6 in Assisi House, Aston. She had been a professed member of the Sisters of St. Francis of Philadelphia for 56 years. Born in Allentown, Pa., Sister Miriam Patrice graduated from Allentown Central Catholic High School before entering the congregation in 1956 and professed her first vows in 1959. She earned a B.A. in history from Neumann University, Aston; an MST in Chemistry from the University of New Hampshire; a M.Ed. in secondary counseling from the University of Shippensburg; and a certificate as director/specialist for older adults from St. Mary of the Woods. In 2005 she received the Distinguished Alumni Award from Allentown Central Catholic High School. Her ministry was dedicated to elementary and secondary education, and in pastoral ministry, particularly in gerontology. Sister Miriam Patrice ministered for 31 years in the Archdiocese of Philadelphia. She taught at St. Benedict School (1959-1961) and Resurrection School in Chester (1962-1967). She served as administrator of Assisi House in Aston (1982-1989) and director of social services at the Care Pavilion in Philadelphia (1990-1992). Since 2008 she has been coordinator of Queen of Peace Convent, an independent living residence for the Sisters of St. Francis. Sister Miriam Patrice also ministered for 15 years in the Diocese of Allentown. She taught at Blessed Sacrament School in Bally (1961-1962) and Allentown Central Catholic High School (1967-1978, 1979-1982). Sister Miriam Patrice’s ministry in the Archdiocese of Seattle included serving as administrator of St. Ann Convent in Tacoma, a retirement residence for the Sisters of St. Francis (1992-1998). The funeral Mass was celebrated Feb. 13 in Assisi House. Burial was in Our Lady of Angels Cemetery. Sister Miriam Patrice is survived by her niece, Lisa Helt, and by her Franciscan family. Hausman, Sister Miriam PatriceAston, PA-Sister Miriam Patrice Hausman, OSF, 77, died in Assisi House on February 6. Catherine A. Hausman was born in Allentown the daughter of Ammon Raymond Hausman,Jr. and Catherine McLaughlin Hausman. She had been a professed member of the Sisters of St. Francis of Philadelphia for 56 years. She was a graduate of Immaculate Conception grade school and Allentown Central Catholic High School. She entered the congregation in 1956 and professed her first vows in 1959. Sister Miriam Patrice earned a B.A. in History from Neumann University, Aston, Pennsylvania; an MST in Chemistry from the University of New Hampshire; an M.Ed. in Secondary Counseling from the University of Shippensburg; and a Director/Specialist for Older Adults from St. Mary of the Woods. In 2005 she received the Distinguished Alumni Award from Allentown Central Catholic High School. Her ministry was dedicated to elementary and secondary education, and in pastoral ministry-particularly in gerontology. Sister Miriam Patrice ministered for 21 years in the Archdiocese of Philadelphia. She taught at St. Benedict School (1959-1961) and Resurrection School in Chester (1962-1967). She served as administrator of Assisi House in Aston (1982-1989), director of social services at the Care Pavilion in Philadelphia (1990-1992), Since 2008 she has been coordinator of Queen of Peace Convent, an independent living residence for the Sisters of St. Francis. Sister Miriam Patrice also ministered for 25 years in the Diocese of Allentown. She taught at Blessed Sacrament School in Bally (1961-1962) and Allentown Central Catholic High School teaching chemistry and providing counseling. (1967-1978, 1979-1982) and pastoral assistant of St.Cyril and Methodius Parish (1999-2008) in Reading, PA. Sister Miriam Patrice’s ministry in the Archdiocese of Seattle included serving as administrator of St. Ann Convent in Tacoma, a retirement residence for the Sisters of St. Francis (1992-1998). Survivors: Preceded by her sister Patricia Hausman Solomon. Aunt Kit as she was known by her family of nephews and nieces: Michael Solomon, Craig Solomon, Lisa Solomon Helt and Michael, Andrew, Chance, Brittany,Craig Jr, Doreen. Services: Services were held at Assisi House followed by Burial at Our Lady of Angels Cemetary Aston – See more at: http://www.legacy.com/obituaries/mcall/obituary.